Was Proto-Sinaitic the origin of the alphabet? The earliest scripts in the world are Sumerian cuneiform and Egyptian hieroglyphs. Both date to the late fourth millennium BCE. Which came first is still the subject of heated debate, especially since Günter Dreyer’s discovery in 1988 of inscribed ivory tags and vessels in Tomb Uj at Abydos, which has significantly pushed back the oldest-known writing in Egypt. The Egyptians themselves employed different scripts through time, but as with the cuneiform used in Mesopotamia through the millennia, a true alphabet never emerged from either form of writing. The potential was there all along but never realized, and most likely for deliberate reasons. The Phoenicians were the first to come closest to developing a true alphabet, to represent their northern Semitic tongue. The oldest inscription dates to around 1000 BCE (Robinson 1995: 164). Exactly how the Phoenicians developed their script is not clear, but it represents only the sound values of their consonants. The first true alphabet, representing both consonants and vowels, was developed by the Greeks. Scholars agree that the Greeks adapted and developed their alphabet based on that of the Phoenicians’, but the mechanics of how this happened are not well understood. The oldest inscription written in the Greek alphabet, representing their Indo-European tongue, dates to 730 BCE (ibid: 167). So where did the idea of the alphabet come from? To be sure it was a remarkable development in the history of writing, and it would forever influence the Western world. Widely used scripts such as Egyptian hieroglyphs and especially Mesopotamian cuneiform were based largely on logographic and rebus principles, although at the same time they contained ample examples of monoliteral signs in which one symbol represented one sound: the very structure of an alphabet. Still, hieroglyphs relied much more on symbols that could represent two or three consonants or, in the case of cuneiform, syllables. In the spring 2010 issue of Biblical Archaeology Review, professor of Near Eastern languages and culture Orly Goldwasser (Hebrew University of Jerusalem) makes a case in her article “How the Alphabet Was Born from Hieroglyphs” that the script known as Proto-Sinaitic was the genesis of the alphabet. Goldwasser’s article is fascinating and engaging, if not a tad ambitious: she makes a good case for her argument, but it should be noted that her argument is not accepted by all scholars. The Proto-Sinaitic script might ring a bell for some of you. It was partly the subject of a 2006 History Channel special called The Exodus Decoded, produced by Simcha Jacobovici. It must be remembered that Jacobovici is neither an historian nor researcher but a filmmaker. The Exodus Decoded was a flashy special and very professionally produced from an entertainment point of view, but it was riddled with errors and was based largely on uncorroborated speculation. It must not be regarded as a professional, academic examination of the biblical Exodus (readers might benefit from this web page, which debunks the show fairly well). In the special Jacobovici turns to the Proto-Sinaitic script as “proof” that Hebrews were working as slaves for the Egyptians in the turquoise mines of the Sinai, and during the course of their slavery they developed a script to represent their language. This is wrong for a number of obvious reasons, so to point out the errors in Jacobovici’s revisionist program as well as to look further into Goldwasser’s interesting argument about Proto-Sinaitic, it is useful to explore the realities behind the situation. No one doubts that Canaanites were working in the turquoise mines. This is well attested in inscriptional material recovered in and around Serabit el-Khadim, a site in the southwest Sinai where the Egyptians extensively mined for turquoise as well as other ores and minerals. Proto-Sinaitic takes us back to the Egyptian Middle Kingdom, and specifically to the reigns of two Dynasty 12 kings named Amenemhat III (1842-1794 BCE) and Amenemhat IV (1798-1785 BCE). Both of these kings sent numerous expeditions to Serabit el-Khadim. It’s known that at this time Egypt was maintaining steady ties with well-established Canaanite city-states along the coastal Levant, and many Asiatics from these city-states were migrating into Egypt and settling into the eastern Delta (Goldwasser 2010: 38). Many of these Asiatics worked in the Sinai expeditions as parts of the mining teams, and they formed regular parts of the workforce at Serabit el-Khadim. They lived with and worked among Egyptians. In other words, these Canaanites were paid workers, not slaves. Jacobovici’s proposal in The Exodus Decoded is further reduced by the simple fact that the Hebrews did not even yet exist at this time. This was the eighteenth century BCE, the Egyptian Middle Kingdom. The earliest verifiable evidence for the existence of the Hebrews appears on the victory stela of a New Kingdom pharaoh called Merneptah; the stela dates to around 1207 BCE, some 600 years after the time of Amenemhat III and Amenemhat IV. Archaeology of the highlands of Judea further reinforces the fact that the Hebrews as a separate and identifiable culture were not emerging until the very end of the Late Bronze Age. That said, we can see that Jacobovici’s proposal about Proto-Sinaitic is untenable on all fronts and need not be considered further. It is always better to turn to the work of a professional scholar who possesses the proper training and experience to evaluate and present evidence. This takes us back to Orly Goldwasser article in Biblical Archaeology Review. I should add before continuing that BAR sometimes has a “bad” reputation among historically adept folks who, in probably being unfamiliar with the magazine, view it as a tool of Bible-thumpers to promote biblical fables and stories. It’s been my experience that quite the opposite is true. I’ve been a subscriber to BAR for years because I find its articles to be well researched and properly balanced on academic grounds. Not quite every single time, mind you, but in the majority of cases. Returning to the subject at hand, the Proto-Sinaitic script was first observed in a 1905 archaeological expedition conducted at Serabit el-Khadim by Flinders Petrie. His wife, Hilda, noticed odd and crudely formed inscriptions in numerous locations at the site (ibid: 41): on boulders and rocks, on the stone walls within the ancient mines, and on the occasional small monuments. Although Flinders Petrie himself was never terribly adept at translating hieroglyphic inscriptions, he believed this odd and crude form of hieroglyphs represented an alphabetic script. He was basically correct. Subsequently Sir Alan Gardiner, one of the giants in the early days of Egyptian linguistics, substantiated Petrie’s theory and performed further work and refinement on the study of the script. For example, among the odd inscriptions Gardiner found frequent mention of b-‘-l-t (Baalat), the Canaanite word for “mistress.” He was able to demonstrate this on a small stone sphinx bearing a bilingual inscription. 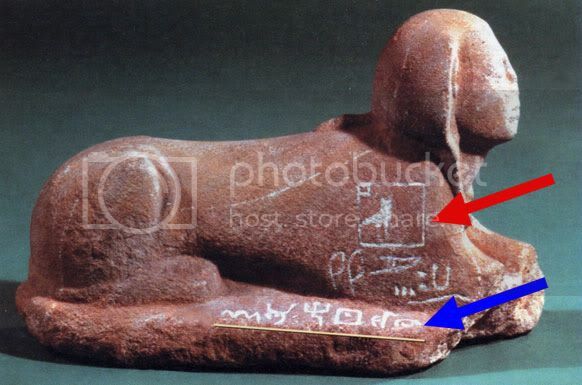 The red arrow points to the Egyptian inscription: Ht-Hr mry Hmt n mfkAt, “The Beloved of Hathor, mistress of the turquoise.” The blue arrow points to the Canaanite inscription, which in translation is close to the Egyptian and of the same theme: m’h( b ) b’l(t), “Beloved of the Mistress.” Hathor was the principal deity venerated at Serabit el-Khadim, where a large temple was erected for her worship and significantly enlarged during the reigns of Amenemhat III and Amenemhat IV. It appears the Canaanites working side by side with the Egyptians were also venerating Hathor, which would not be unusual. It behooved one to venerate in proper form the deity of any important place, whether or not that deity was from your own culture. It’s possible the Canaanites who developed the script we call Proto-Sinaitic were not even literate. Quite simply, most people were not. But working at Serabit el-Khadim, they were surrounded by temple walls, stelae, statues, and other monuments covered with Egyptian hieroglyphs. They would not have known how these glyphs worked as a written language, but they were able to adapt certain signs to represent the sounds of their own language. In doing so they used an individual Egyptian glyph for its acrophonic vlaue in their own language: this means a symbol stands not for a depicted word but for its initial sound (ibid: 42). See this chart. 1. Ox head: the sound value kA in Egyptian, aleph in Canaanite. 2. House plan: the sound value pr in Egyptian, bêt in Canaanite. 3. Hand: the sound value d in Egyptian, kaf in Canaanite. 4. Water ripple: the sound value n in Egyptian, mayim in Canaanite. 5. Rearing cobra: the sound value D in Egyptian, nahash in Canaanite. 6. Eye: the sound value ir in Egyptian, ‘ayin in Canaanite. 7. Head in profile: the sound value tp in Egyptian, rosh in Canaanite. The sound used by the Canaanites for their reading was the first sound appearing in the word. Thus, for the ox head, the sound was an ” ‘ ” (a weak consonant); for the house plan, a “B”; for the hand, a “K”: for the water ripple, an “M”; and so on. These Canaanites’ ties with their homeland in the Levant is further emphasized at the site of Serabit el-Khadim by several monuments and inscriptions in which a man name Khebeded makes an appearance. He is described in Egyptian inscriptions as “Brother of the Ruler of Retenu,” the designation “Retenu” being the Egyptian word for the territory roughly between modern Gaza and the Baqaa in Lebanon (ibid: 45). This was Canaanite territoy. Here is one of the monuments in which Khebeded appears. Khebeded is farthest left in the procession of men. All the others are Egyptians and Khebeded is identified by his “mushroom”-shaped headgear (circled above), a classic form of Canaanite apparel at this time. The inscription running vertically in front of him states: sn n HKA n rTnw, “Brother of the Ruler of the Retenu.” Khebeded was one of the Canaanites present at Serabit el-Khadim, where he retained his title of prominence. This is further evidence that the Canaanites in residence at the mines were certainly not slaves but valued members of the workforce. Slaves were not allowed titles. Upon returning home, the Canaanites working at Serabit el-Khadim brought their script with them. How much influence the script had from there remains the subject of debate. Goldwasser is the latest scholar to argue that it eventually was adapted to serve as writing among the Phoenicians and others, but not all agree with this premise (cf Robbinson 1995: 160). To be sure, it is not exactly the same as the script used by the Phoenicians, nor should it be mistaken for the origin of the Hebrew script. People are too quick to turn a lot of events from ancient Egypt into the origin of everything Hebrew. This is a gross oversimplification. A case in point. The Hebrew kingdom was starting to emerge in the Levant in the Early Iron Age, and literacy appears not to have been a fixed part of the culture until the end of the eighth century BCE (Finkelstein & Silberman 2006: 86). For instance, the Solomonic legends appear to have been first put to paper in the seventh century BCE (ibid: 175), and we have evidence for extrabiblical prayers from the site of Ketef Hinnom that would later appear as Numbers 6:24-26 and dating to about the same time (Barkay 2009: 124). But the earliest form of Hebrew script cannot be tied with any certainty to Proto-Sinaitic. The Canaanites had left Serabit el-Khadim long before the Hebrews existed, as I stressed earlier. It’s believed the Hebrew script was adapted from the Phoenician script possibly as early as the ninth century BCE and was later heavily influenced by the Aramaic script (Robinson 1995: 172). Although Proto-Sinaitic appears to have been used to a limited extent in the Levant, it disappears entirely from the historical record at the end of the Bronze Age, when civilizations of the Near East experienced wide-spread collapse. Now, this was about the same time the Phoenicians were developing their script, so it remains possible that Proto-Sinaitic influenced the Phoenicians. The situation is not clear but we can point to the occasional tidbit of evidence of how Proto-Sinaitic entered permanent usage. A well known example is the Egyptian water ripple which represented the sound value n, which was used in Proto-Sinaitic to represent the sound “M” (see the chart above), and which does appear to have been adapted into the Phoenician alphabet to represent the same sound. It remained that way in subsequent scripts, so we owe our Western letter “M” to the humble Egyptian water ripple. The origin of the alphabet remains an interesting subject for debate and discussion, and perhaps this is so simply because there are still questions to answer. Flashy and superficial TV specials like The Exodus Decoded might muddy the waters of logic and common sense, as is the tendency of historical revisionism, but legitimate historical research continues in the hopes of filling in the blanks. Barkay, Gabriel. 2009. “The Riches of Ketef Hinnom.” Biblical Archaeology Review. 200th Issue, July/August. Finkelstein, Israel and Neil Asher Silberman. David and Solomon. 2006. Goldwasser, Orly. 2010. “How the Alphabet Was Born from Hieroglyphs.” Biblical Archaeology Review. April. Robbinson, Andrew. The Story of Writing. 1995. This is a brand-new site. I’ve just begun building it, so it will be under construction for a while. I hope to attract readers in the near future, so please bear with me for the time being!